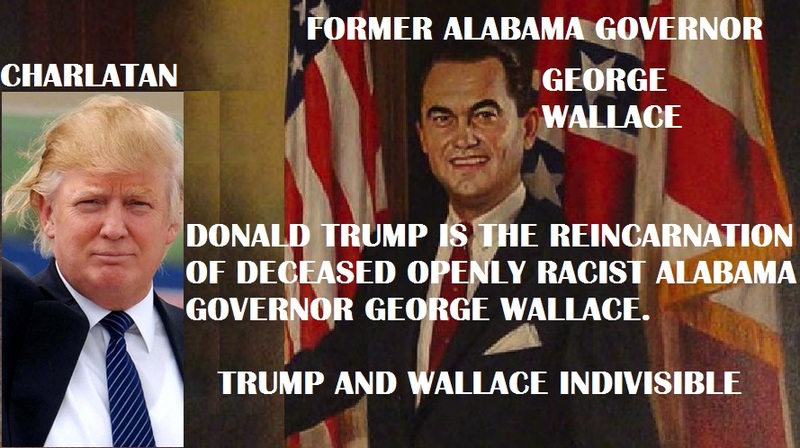 Donald Trump Is The Reincarnation Of Deceased Openly Racist Alabama Governor, George Wallace. 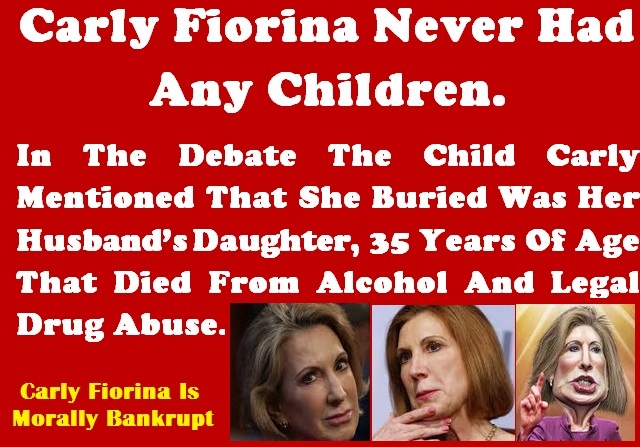 To Deny That Trump Is A Racist Would Be The Same As Believing You Are Dead When You Are Not! 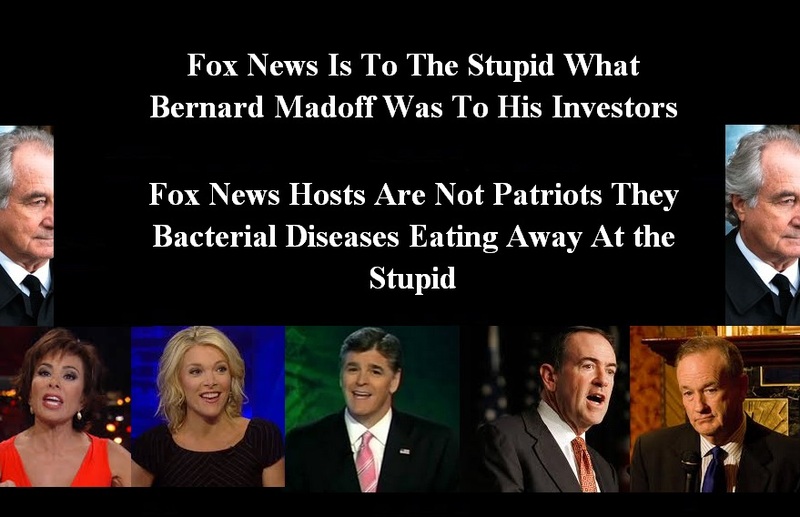 The Now Owned Corporate Media Are Too Busy For Ratings And Ignore The Enormity Of Donald Trump’s Racism, However, Trump’s Ideas Weren’t Born Because He Is Running For President. Donald Trump Has Been, Is And Always Will Be A Racist, Bigot, A Charlatan And Mountebank. Donald Trump is more dangerous than the Iran Deal because Trump is sowing discord from inside America, creating Anarchy with people hiding behind Anarchists to cover up their racism. 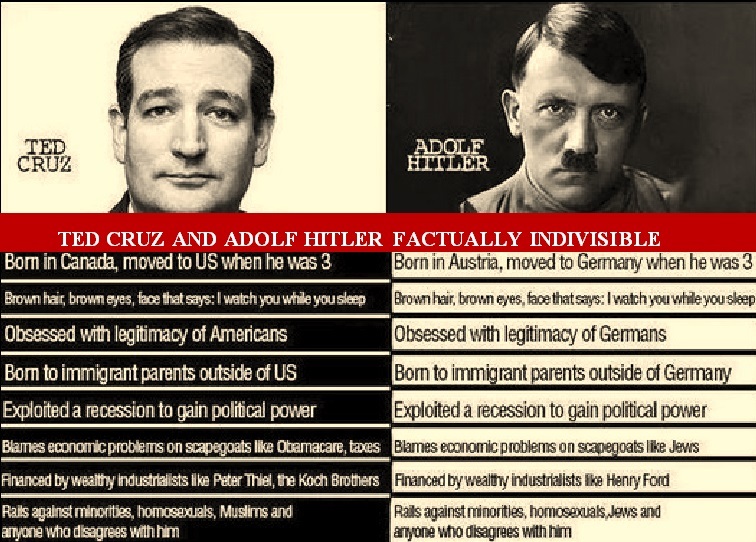 This man Donald Trump is a product of the extreme right-wing within the Republican Party. GEORGE WALLACE ALABAMA RACIST GOVERNOR! “Anthony and Henry Lee were no different than thousands of other black Southern teenagers caught in the intense battle over the implementation of Brown v. Board of Education. But their names would go down in history. Alabama Gov. George Wallace took office in January 1963 vowing “segregation now, segregation tomorrow and segregation forever.” Two weeks later, Montgomery civil rights lawyer Fred Gray filed Lee v. Macon County Board of Education, seeking to have 14 African-American teens, led by Anthony and Henry, admitted to the all-white Tuskegee High School. U.S. District Judge Frank M. Johnson Jr. granted Gray’s petition in July. On Sept. 2, the day classes were scheduled to start for the fall term; Wallace issued an executive order shutting the school for a week and instructed the state police to enforce his decree. Within days, Judge Johnson and four other federal trial judges in Alabama jointly issued a restraining order instructing the governor to stop interfering with the court-ordered desegregation of public schools in Birmingham, Mobile and Tuskegee. 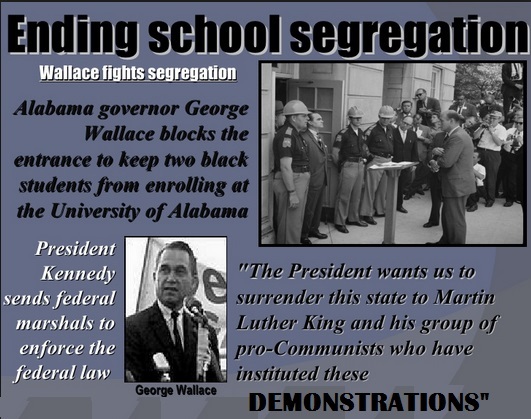 When Wallace ordered the Alabama National Guard to stop any nonwhite children from entering all-white schools, President John F. Kennedy federalized the guard and had them return to their armories. But the governor wasn’t through, and he declared the state would reimburse parents if they sent their children to a new all-white private school or an all-white public school in a neighboring district. When Tuskegee High’s doors opened Sept. 9, the only students attending were the black children. Wallace then ordered the school closed, leaving the traditionally all-black Tuskegee Institute High School as the only option for students of color. 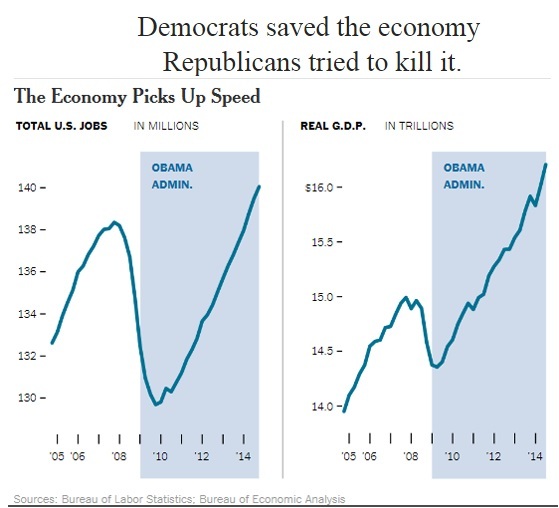 President Obama and the Democrats saved the Economy; the Republicans tried to kill it and now they shamelessly want to take credit for the recovery. Of course, McConnell isn’t just wrong about the timing of the accelerating Obama recovery, which in the second and third quarters of 2014 had ramped up long before a GOP takeover of the Senate seemed likely. As it turns, the Republican Party deserves zero credit for the improving American economy. Make that less than zero. After all, from their opposition to the stimulus, the auto industry rescue, and the fed’s “quantitative easing,” to their debt-ceiling hostage-taking and draconian austerity policies in Washington and the States, Republicans have been undermining the economic recovery from the moment Barack Obama first took the oath of office.